Flygt F-pumps handle capacities of up to 200 l/s (3200 gpm), with motors from 1.7 to 47 kW (2 to 65 hp) and pumping heads of up to 81m (260 ft). Flygt F-pumps handle capacities of up to 200 l/s (3200 gpm), with motors from 1.7 to 47 kW (2 to 65 hp) and pumping heads of up to 81m (260 ft). These energy-efficient chopper pumps are specifically designed for heavy-duty applications and run continuously with sustained hydraulic efficiency in wastewater applications, sludge pumping, and agricultural applications. Flygt F-pumps feature patented Flygt N-technology, which is renowned for its self-cleaning capabilities and sustained high efficiency. All components work together without sacrificing the pump's overall hydraulic performance. Pumping efficiency remains consistently high without sacrificing its superior clog resistance. 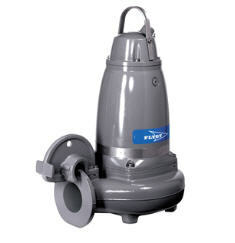 The F-pump cuts through all types of tough and difficult solids, making it virtually clog-free. Flygt F-pumps demonstrate unmatched reliability in installations worldwide. These chopper pumps perform like no other, handling whatever goes down the drain–from plastic bottles, fibrous material, and wood to clothing and motor cables. Additional unique features include Hard-Iron™ impeller and cutter plate, Active Seal™.